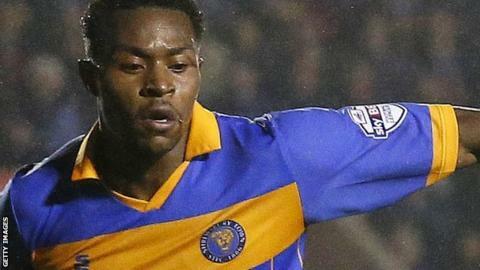 Jean-Louis Akpa Akpro scored twice as League Two promotion chasers Shrewsbury stayed second despite thrashing Exeter. Akpa Akpro gave the hosts the lead when he found the net with a stabbed shot from inside the box. James Collins then turned in a corner to double the lead after the break before Akpa Akpro swept home Jordan Clark's cross from the right. In stoppage time, substitute Tyrone Barnett hammered an unstoppable shot into the roof of the net from 18 yards. Despite having now won six successive games, Micky Mellon's men remain a point adrift of leaders Burton Albion, who are unbeaten in eight matches. But Shrewsbury are now 10 points clear of fourth-placed Bury, who they now play at Gigg Lane on Tuesday night. The Shakers have a game more to play, but, if Shrewsbury win, and Southend fail to beat Newport, the Town will be promoted back to League One for the second time in three years. "That was an absolute masterclass from us, from the first minute to the last. The lads who came into the new system produced a terrific performance and to score so many goals was fantastic. "It's terrific to get the club record of clean sheets in a season. Defending is a big part of the game and we take huge pride in it. "The players have not got sloppy at any stage and have to get credit for that. We will continue to do everything we can to go on and win the league." Match ends, Shrewsbury Town 4, Exeter City 0. Second Half ends, Shrewsbury Town 4, Exeter City 0. Scott Bennett (Exeter City) wins a free kick in the defensive half. Goal! Shrewsbury Town 4, Exeter City 0. Tyrone Barnett (Shrewsbury Town) right footed shot from the centre of the box to the bottom left corner. Assisted by Andy Mangan. Foul by Andy Mangan (Shrewsbury Town). Christian Ribeiro (Exeter City) wins a free kick on the right wing. Foul by Mark Ellis (Shrewsbury Town). Attempt blocked. Scott Vernon (Shrewsbury Town) right footed shot from the centre of the box is blocked. Substitution, Shrewsbury Town. Tyrone Barnett replaces Jean-Louis Akpa-Akpro. Attempt missed. Alex Nicholls (Exeter City) left footed shot from outside the box is just a bit too high. Alex Nicholls (Exeter City) wins a free kick in the defensive half. Mickey Demetriou (Shrewsbury Town) wins a free kick on the left wing. Foul by David Wheeler (Exeter City). Corner, Shrewsbury Town. Conceded by Liam Sercombe. Attempt missed. Keith Southern (Shrewsbury Town) right footed shot from outside the box is high and wide to the right. Foul by Keith Southern (Shrewsbury Town). Goal! Shrewsbury Town 3, Exeter City 0. Jean-Louis Akpa-Akpro (Shrewsbury Town) right footed shot from the centre of the box to the bottom left corner. Assisted by Jordan Clark. Jermaine Grandison (Shrewsbury Town) is shown the yellow card. Ryan Harley (Exeter City) wins a free kick in the attacking half. Substitution, Exeter City. Alex Nicholls replaces Matt Oakley. Goal! Shrewsbury Town 2, Exeter City 0. James Collins (Shrewsbury Town) left footed shot from the centre of the box to the centre of the goal. Corner, Shrewsbury Town. Conceded by Jamie McAllister. Substitution, Exeter City. Clinton Morrison replaces Danny Butterfield. Substitution, Exeter City. David Wheeler replaces Graham Cummins. Attempt missed. Mark Ellis (Shrewsbury Town) right footed shot from outside the box misses to the left. Hand ball by James Collins (Shrewsbury Town). Attempt missed. Mark Ellis (Shrewsbury Town) header from the centre of the box is close, but misses to the left. Second Half begins Shrewsbury Town 1, Exeter City 0.